blush or bronzer: blush! I feel bronzers looks muddy on my skin tone. eye liner or mascara: mascara! foundation or concealer: foundation, a good foundation covers everything, so no need of concealer! 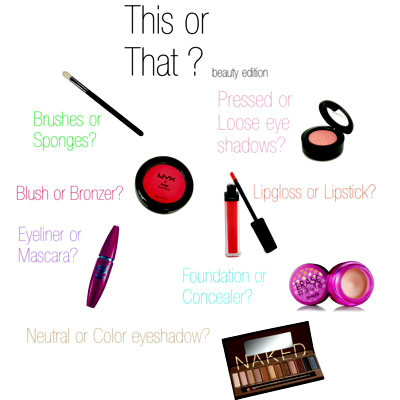 neutral or color eye shadow: neutral, I am not much into eye makeup. brushes or sponges: definitely brushes! OPI or china glaze: this is so difficult, :P but if I had to choose it would be OPI! Flower or no flower: both! I love doing nail art. perfume or body splash: perfume. lush or other bath company: this is not a fair question, :vD I love lush and many other brands too! long sleeve or short: short sleeve! flip flops or sandals: sandals! studs or dangly earrings: studs, I hate any kind of heavy accessories! necklaces or bracelets: none! I can’t stand having anything on my neck and wrist except my titan raga watch. heels or flats: flats, for me its being comfortable when it comes to shoes. forever 21 or charlotte russe: forever 21, love their dresses and hair accessories. bobby pins or butterfly clips: bobby pins! side sweep bangs or full bangs: side sweep bangs! up or down: down, I love keeping my hair open. Haha! Sun a fun post! Hey, this is such a fun post. Wonder what you have to do to get tagged. I'd love to do it too.